Is UX Certification worth it? In January 2019, we contacted 292 people who had taken and passed the BCS Foundation Certificate in User Experience. Each person had sat the exam after attending one of Userfocus's face-to-face training courses (either a public course or an in-house course). Since candidates can sit the exam independently and take the exam through other training providers, this is a subset of the total number of people who hold the BCS Foundation Certificate in User Experience. 43 of the people we contacted had moved jobs or were out of the office, leaving a final sample of 249. Of those, 60 (24%) replied. We asked each of these people a single question by email: “What impact has attaining the BCS Foundation Certificate in UX had on your job?” Participants were free to write as much or as little as they wanted and there were no pre-defined categories. Some participants wrote a single sentence whereas others wrote a few paragraphs. Working independently, we examined the responses to identify common themes. (“We” in this article refers to the authors, both PhD psychologists experienced in thematic analysis). We then compared results and agreed a final set of over-arching themes. Every participant's comment was encapsulated by one or more of these themes. We expand on these themes in the following sections. To capture the spirit of each theme, we have included verbatim quotations from participants in the research (in some cases these quotations have been edited to remove identifying information). We also specify the number of participants who volunteered material that we categorised as belonging to that theme. Note, however, that this is qualitative research: this means we can't use the number of participants mentioning the theme as an indicator of frequency in the wider population. Moreover, this was not a survey so the fact that a participant did not volunteer a theme (such as 'self-confidence') in their freeform answer should not be taken to mean that this did not apply to that participant. This research was a pilot study into the impact of UX certification and like all pilot studies requires further research to triangulate the findings. In particular, we acknowledge that the majority (76%) of people who have gained the certificate through Userfocus did not respond to our call for participants. This may be because they didn't want to take part in the research, or because they fall into theme 10 (“I've not had the opportunity to apply what I learnt”) and felt there was no point replying. If we had been able to include these people in our research, perhaps other themes would have emerged. A second area for future research is in disambiguating the effects of certification from the effects of training. Indeed, as you can see from the quotations above, some participants talk about the “course” (i.e. 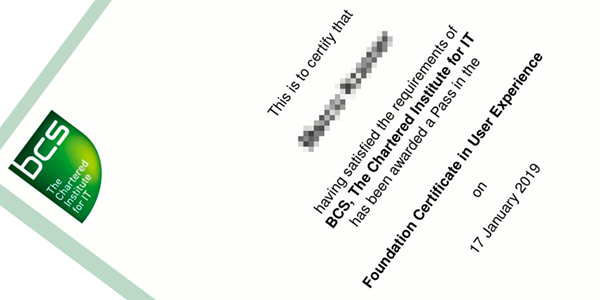 the BCS syllabus) whereas others talk about the “certificate”. Although theme 3 (“It has boosted my credibility with the development team”) is probably wholly due to certification, other themes (such as “I learnt specific tools, techniques and skills that I apply in my job”) would have emerged in the absence of certification. Other themes (such as “It has increased my self-confidence in my day-to-day work”) are probably equally due to the training syllabus as to the certification itself. To decouple the effects of training and the effects of certification, we would need to carry out research with people who obtained the certificate in the absence of attending a training course (for example, through self-study). Unlike vendor-based certification schemes, people can sit the exam for the BCS Foundation Certificate in UX without first taking a training course from an accredited training provider. This means such people exist in the real world and we would like to see further research carried out with that cohort to see if the same themes, or other themes, emerge. We hope other training organisations that offer UX certification will carry out a similar research activity to establish the impact, or otherwise, of their certification programs. Anna-Gret Higgins holds a BSc in Psychology and a PhD in Counselling Psychology. She is a Chartered Psychologist and an Associate Fellow of the British Psychological Society. Anna-Gret manages the usability testing team at Userfocus and has logged hundreds of hours in usability tests of public and private sector web sites. What one UX skill or ability is the most important to master?